In order to be able to bill, the billing tool needs access to your Lightspeed account. 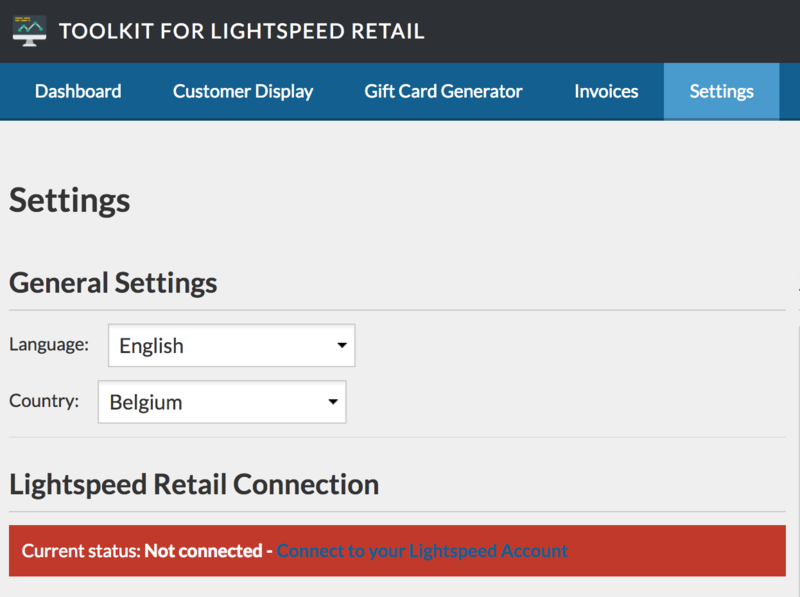 Currently we support linking with a Lightspeed Retail account. Click on the "Settings" button at the top of the menu. Under Language, we select "English". Also choose the correct country if this is incorrect. Now we see that under the heading "Lightspeed Retail Connection" there is a red bar. We click on the "Connect with your Lightspeed Account" button. Is this bar green? Then you are already connected to Lightspeed! Now we are redirected to the Lightspeed login page. Fill in your Lightspeed retail data and then click on "Sign in". The following screen asks if we want to grant the application on our Lightspeed account. Click on "Authorize Application"
If everything has been executed correctly, you will be redirected to the MDware invoicing settings page. We see that the red bar has turned green and that the "Current status" is "Connected". Our MDware account is now linked to our Lightspeed account.